Just turned 150k on our 2005. Owned it since 2010 with 42k miles. HV battery was replaced 3 years ago at 104k miles with a 2012 take-off. 12v was replaced 6 years ago with an Optima D51. Transaxle fluid has been 4qt drain/filled at 60k/120k and will get it again at 180k. Brake pads are still original, but will need replacement by 180k with only 3/32 left up front. Oil changed every 10k, first with 5w20, then 0w20 when it became approved for use. Coolant inverter pump recalled and replaced at about 60k, then failed and replaced at 140k. That has been the only real failure, besides the high voltage battery that died at 8 years 8 months. We did the coolant and brake fluid flushes at 120k along with plugs, wires, and PCV valve. Other than that, still runs like a top. Not too squeaky either. Still a fairly quiet ride. We'll be purchasing her 4th set of tires within the next 5k. So far, the longest lasting tires were the originals at about 60k miles. EP422s only went about 50k, and undersized 195/60R15 Conti ProContact are only going to have been about 45k when they get replaced. 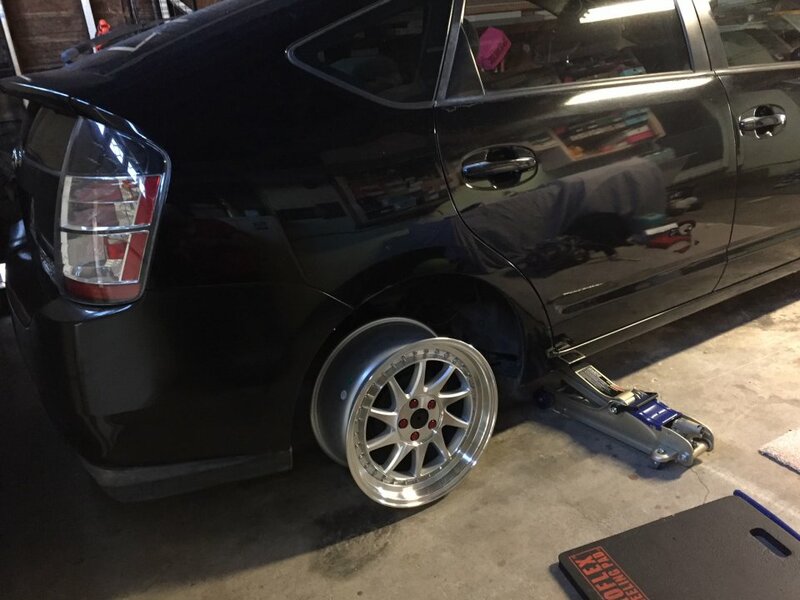 We did have a road hazard replacement on both of those non-OEM sets though, and wear seemed to accelarate after a new tire was installed on both sets. Perhaps we'll have better luck with the next set and avoid a road hazard replacement. Looking forward to making 200k! This is my 2008. Still pulling wicked MPG. Ive never replaced the battery. Probably won't, but then again I'm thinking of a bumblebee replacement when its time. Just recently the DC/DC Inverter pump has been going CONSISTENTLY, sometimes for a constant 5 minutes. A/C still runs somewhat cool, struggles above 100+ or so I'm thinking of recharging because I live in California. I have a Tanabe branded strut bar installed on the undercarriage. Really helps tighten the handling up nicely, and helps save MPG (but not tires). Car is due for an oil change and will be switching to M1 AFE SAE 0w-30 full synthetic. Not sure what the last business put in but it sure starts rough. My first post too! This community seems so great and I look forward to being part of this family. Below is an attached image of single trip MPG and ODO. Welcome! That is amazing mileage. Was the engine already warmed up? Normally, the first bar would be much lower. Even so, terrific!! ... Just recently the DC/DC Inverter pump has been going CONSISTENTLY, sometimes for a constant 5 minutes. Are you referring to the brake actuator pump? 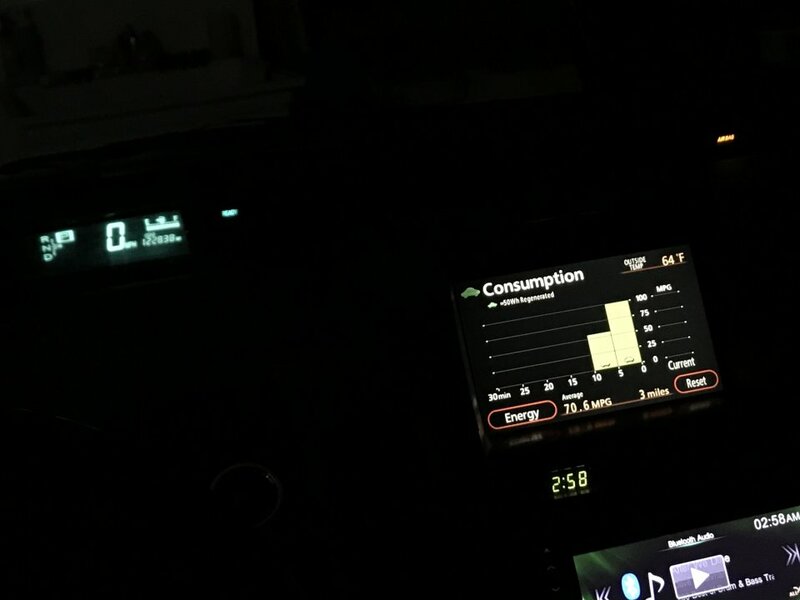 The inverter coolant pump is supposed to run at all times when the Prius is either IG-ON or READY. 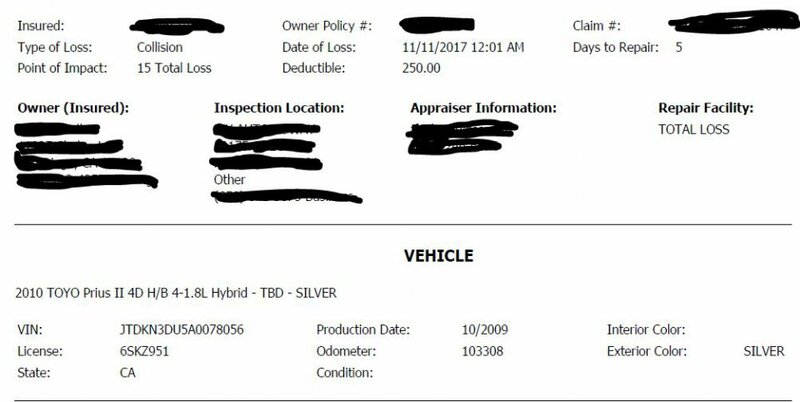 If you are in fact referring to the brake actuator pump running excessively, you should get that checked out as it may be covered under the extended warranty offered by Toyota on that part. Do a PC search for more info about that. tacobellcrunch and jerrymildred like this. Engine was warm for sure. Forgot to mention . Just was preforming the good ol' "no arrows screen" for the majority of the trip back from filling up at Valero. And to answer you Patrick, even tho you aren't the quoted text above, I will take a video ASAP of that noise. I know the brake actuator pump is that "rattlesnake-like" sound, and it definitely isn't that. Found a youtube video with the exact same noise. The video is best to watch starting @ 51 seconds. That noise will go during an entire drive thru run at my local Starbucks, from ordering to driving away. Just hit 100,000 miles. Got it at 30k in 09. Regular oil changes, tire changes. At 60k, replaced PVC (old looks like new, and works good too), and drained and filled transmission oil. Replaced water pump under extended warranty, as well as the coolant pump. From 60k onward doing my own maintenance with full Synthetic oil (Penzzol or Mobile 1). Observed slight oil burn. Dipstick goes from full to half-mark before the next oil change. Observed some nonuniform tire wear, need to check alignment. Not sure what kind of alignment is needed, 2 Wheel, thrust, or 4 wheel, and how much it costs. I have a Prius with 130K and starting to put in a little love. My wife's 2007 Touring just turned 103K. We bought it in 2012 with 35000 miles on it. The car immediately needed a couple of tires (the dealer had replaced two of the godawful Turanza EL 400s that were OE) so we picked up some Ecopias to keep it in the family. One of the HID bulbs quickly croaked, I replaced a misfiring fuel injector around 50K and both front wheel bearings were done around 85K. Of course there were a couple of recalls as well, and we needed a fresh secondary battery at some point. But beyond that, it's been 68,000 trouble-free miles. To mark the milestone, we replaced all coolant and brake and transmission fluid. I've got a fresh set of plugs I'm going to put in this afternoon. Bought it brand new in September aught six. Just hit the 100,000 on Monday. No record breaker here, but still interesting - I just met a fellow with a 2005, 120,000 miles. Man, was I impressed! My wife's '07 is about to hit 120k. The '05 it replaced was over 170k when a texter totaled it. My '05 had 150k when I traded it. Just an update. Took my 08 Prius across country through the Rockies and had a check engine climbing the peak. 125000 miles at the time. Landed in Nebraska for the eclipse and saw the amazing eclipse in grand island. After I got back in the car the light was off. Drove it to my destination in Michigan without it coming back on. In the month I was in Michigan about week two I was there the light came back on, took it to o’Reillys and had a p1121 code. That sound I mentioned in my previous post must have been the pump because now it’s repaired and the car doesn’t make that sound and runs like I drove it off the lot. Swapped out the M1 oil for Amsoil, and a noticeable difference in engine startups. Drove it from Michigan to California heading through Oklahoma this time and down thru flagstaff and back to the Central Valley. Car ran exceptionally well but my battery in the hills would stay at 4-5 blue bars max with it dipping to 2 purples at strong grades. Coming back in from Tehachapi, I had a full green battery on the grade back down into the valley. Any input on battery’s health? 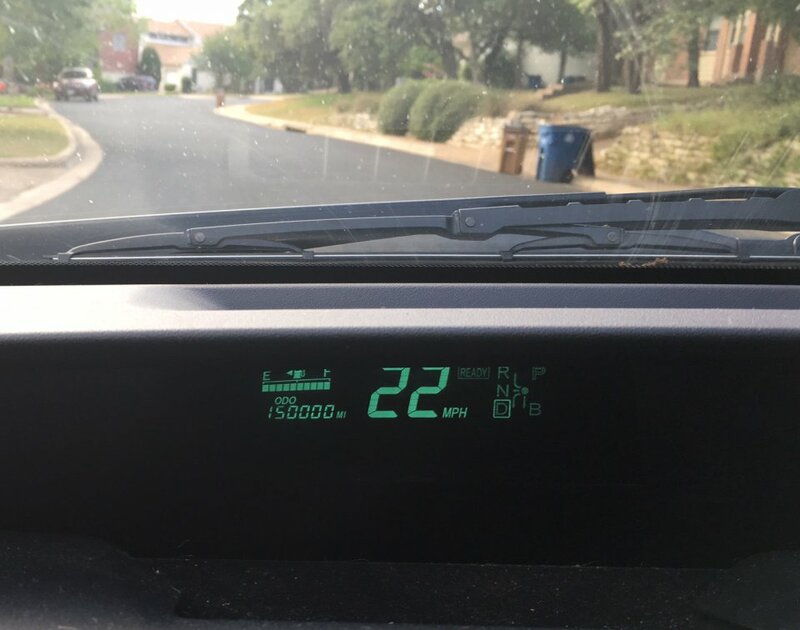 Prius now at 130.5k ODO. That battery performance is pretty much a duplicate of ours up the I-15 and I-80 around to Denver then back on the I-40. I don't think we're in need of replacements yet. I am currently on 181k miles! Up to 100k I had no isses with any part of the vehcile at all, other than tyres, brake pads etc. I get about 45mph. I use the car a lot for commuting, probably about 60 or 70 miles per day. I am having issues lately. At about 145k the hybrid battery died so I had to get a cell changed. Another one went a few thousand miles later. A warning light is on, something to do with the emissions and the car seems to have a hole in the exhaust or something judging by the noise. The hybrid warning light seems to come on every 325 miles or so and then after about 50 miles is goes back off with no changed in the car's handling or performance. MOT is in January. What I do with it will depend on how much money it takes to get it to pass. Just joint the Prius cult and bought a 2009 with about 119k on it. Someone turned right from the middle lane on the highway and totaled my Corolla which was at 261k and running beautifully. The Prius is my silver lining. The original owner had all the maintenance and repairs done at a local dealer who reported to Carfax, so I believe I have all the records. Carfax gave it some special rating for having done oil changes as required for the entire life of the car. My purchase included his snow tires and a bike rack. Car has always "lived" in Minnesota.  Every scheduled maintenance item has been performed on time. Oil changes seemed to be anywhere from 3000-5000 miles. Tires were swapped every spring and fall, but I can't tell if there were ever any brand new ones. First couple tanks of gas I used, registered over 46mpg. That quickly changed with cold fall weather and swapping for snow tires. Still over 40mpg on average. My Wife's 2010 was declared a "Total Loss" today. Hit and Run in the middle of the night. So very sorry. Hate to see it end that way. pilotgrrl and gamma742 like this. Data Daedalus, jerrymildred and kenoarto like this. UK Based 2008 Gen II Prius Tspirit (a.k.a. The Spaceship) - bought used at 54,500 miles in June 2013; first owner was apparently a Bank (company car). Presently at 99,949 miles, as I prepare to cross the 100,000 mile barrier. Overall during my ownership, replaced the brake discs and pads front and rear, both front propeller shaft boots, mechanical water pump, one new 12v battery, 4 x LRR Michelin Energy Saver Tyres.....and that’s it. Regularly serviced and also in daily commute service of 34 miles round trip per day in all weather conditions. Feels like it’s just getting run in. Absolutely delighted with this beautifully engineered gem of a futuristic vehicle. Looking forward to finally crossing 100,000 miles shortly. Dream vehicle? A Prius Prime in electric blue!